I have co-workers from all parts of the world -- from Argentina, China, Greece, Japan -- as well as from all parts of the United States. There are often fascinating differences among us, of course, though I am as often struck by how much alike we are. Still, it is the colleagues from the American south with whom I have the best conversations. The shared cultural background means there is much we can leave unsaid, because we all know certain things. The subtle art of biscuit-making, for example, or the etiquette of funeral casseroles. Pralines. 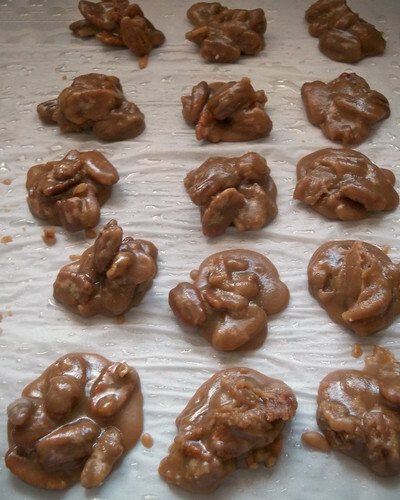 Near Christmas, I often bring in pralines made from my great-grandmother's recipe. Everyone likes them, but the people with roots in the Gulf Coast appreciate them more deeply than do the Midwesterners, probably in part because they had grandmothers or great-grandmothers who made pralines too. Some of them even have the recipes, though sometimes the recipes have been lost due to someone (if not the grandmother, then an aunt) keeping them secret and not bequeathing them to the next generation. I don't much care for the idea of secret recipes or secret ingredients, and I care even less for losing something beautiful and perfect in the mists of time when it's so easy to pass it along. Do I fear that someone will take it over and displace me? No, honestly. Even if you do use the same recipe, you will not make exactly the same pralines I do. These are not hard to make, but if you are not an experienced candymaker, you should use a candy thermometer. This recipe makes about two and a half dozen tablespoon-sized pralines. In a heavy saucepan combine sugars and half and half. Bring to a boil, stirring occasionally. Continue boiling until mixture reaches 228 F on a candy thermometer. Stir in nuts, butter, and salt. Cook, stirring, until some candy dropped into cold water forms a soft ball, 236 F on the candy thermometer. Remove pan to a wire rack. Stir in vanilla, beat until almost thick, then drop by tablespoonfuls onto oiled waxed paper or parchment paper. Cool completely. Store between layers of waxed (or parchment) paper in a cool, dry place.